CD review: "I'm Back ... at Carnival Time"
This review first appeared in the July/August 1990 issue of Living Blues magazine. Mardi Gras may come but once a year, but that spirit of revelry can strike any time, anywhere. 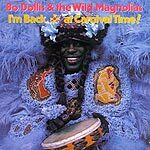 When such a mood strikes, Bo Dollis and his Mardi Gras Indian tribe, the Wild Magnolias, provide the perfect soundtrack. But be warned: This is addictive, infectious music. Stereos have a habit of finding their volume cranked up, the bass increased, and the speakers given a workout when the Magnolias are being played. No dry dissertation on probably influences or varied techniques can possibly do justice to this celebration of living, a sheer explosion of joi de vivre. This recording is the first by the Magnolias in 15 years. Its strength is not only in the performance, but in New Orleans classics such as "Iko, Iko," "Golden Crown," "Battlefront," "Jockomo, Jockomo" and "Tipitina." The Magnolias are a traditional Mardi Gras Indian tribe, with only vocals and percussion. For this recording, though, they are joined by Snooks Eaglin on guitar, George Porter Jr. on bass, and the New Rebirth Brass Band. In addition, fellow Mardi Gras Indian Chief Monk Boudreaux (of the Golden Eagles) joins on vocals for "Jockomo, Jockomo." Dollis and the Magnolias are never overwhelmed by the additional musicians, though, and those familiar with the above musicians will know that they have the energy needed to keep up. In fact, music buffs will find particular interest in the three tunes where the Rebirth Brass Band joins in ("Shallow Water," "Big Chief" and "Tipitina"). For here two of New Orleans' oldest musical traditions  the street brass band and the Mardi Gras vocal combo  are brought together on common ground.